Again lots of rain in the night makes me nervous and I hope it will be better in the morning. Actually at 9 a.m. the sun comes out and I start without my rain gear. It is only 10km to the border. I get my stamp in my passport and go to the police. He is sing me for my insurance for Bolivia. I give him my green Allianz paper knowing that Bolivia is not mentioned in it (even I have paid for it and it is confirmed in an email). As I’m leaving the country now he lets me go. At the Aduana the officer is very thorough and compares even my chassis number one by one. Then I can pass. Only 100m further is the Peruvian border. Again the stamp in my passport and crossing the street to the Aduana. I know from others that they bought the insurance in the country and I hoped I could do it here as well. But not at this border. The officer says that I have to park my motorbike here and have to buy first the policy. He tries to reach somebody by phone who sells insurances but this guy is back at 4 p.m.. If I promise him to drive carefully and to buy immediately a policy in Puno he will issue the papers. Of course I’ll do. “Well, now I have done something for you, what will you do for me?” he is asking. I open my purse and give him my money which I have just changed into Soles. By far too much I realized afterwards. But he opens the barrier and I can pass. However only after 10m my journey stops again. The police officer wants to see all my papers including the insurance policy. He is very friendly and is talking to me like an “amigo”. But without the policy I have a problem. I’m fed up and after a while he is as well willing to let me go, but wants some money for his offer. I show him my purse that is absolutely empty. A bit louder – so all around can hear it – I apologize for not knowing that I need cash for the Peruvian police. But I will have it the next time. Then he lets me go. Being bushed I’m heading to Puno being curious how many police controls will wait for me on this way. The fine is up to 400 Soles (€100,-) for driving without insurance. The road to Puno is not very attractive. Many little villages with a lot of left houses. From time to time I can see the lake again. Luckily no more check points and so I reach Puno at 2 p.m.. So far Peru is not my country. However this changes immediately when I arrived at the hostel „Los Andenes“ and Raúl opens the door. He gives me a smile and asking me how my trip was. When he hears of my border experiences he is very sad about his own country’s people. He doesn’t understand why they behave like this. I can park Felge in the lobby and he is helping me with all my luggage. Very kind! I walk to the Plaza de Armas and ask at the tourist info for an agency selling policies (so called SOAT here). There is only one that is around the corner. It will open at 3 p.m. and I’m waiting with some other people. As it is still closed at 4 p.m. I call a cell phone number and ask the lady when he will… suddenly he appears. But he has no forms. He brings me to another office 100m back to the tourist info where his friend is helping me instantly. When he saw that I’m German he says that 2 days ago another German biker was here. I ask him if this was Alex and he agreed. So funny! I make some copies in the store next to the office for 0,30 Sol and after 10 minutes I have finally my much sought-after document for 97,50 Sol (€25,-) per month.At 10 p.m. an email reached me from Habraham of the Floading Island Uros Khantati (www.uroskhantati.com). The pick-up will be at 10 a.m.. Including transfer, dinner, lunch, breakfast and accommodation it costs 200 Sol. On time I get picked-up and together with Craig (California), Sarah (Australia) and their 13 month old daughter Abigail we drive to the boat where Habraham is waiting for us. After 20 minutes we reach the one out of 87 islands. I meet Leoni and Eva who gave me this tip. They are leaving now. There is hammocks, parasols and sunloungers. Habraham is just building a new house and the reed roof needs to be installed. It is really heavy. The quality is better than of the other houses and need a change only after 12 months while the others have to be changed already after 6 months. The house’s walls as well as the ground of the island have to be replaced every 6 months. Victor, the boss of the island, is taking us with the famous puma head boat out for a short trip for fishing and showing us how they cut the reeds.. In the afternoon is gets fresh before the sun comes out again. I wear the traditional cloths and Cristina, Victors’s wife is taking many pictures. I enjoy the silence and, later on the dinner. When we go to bed a hot-water bottle is already in our beds. But the blankets are very heavy and so I awake often in this night. At the next morning Habraham brings us to a speed boat that drives in 75 minutes to Taquile. Here live about 2500 Quchua. Only men are doing the famous hand crafts which is part of the UNESCO world heritage. We here a lot about the traditions, their cloths and dances during lunch. In the evening we are going to a nice restaurant with live music and dancers. Unfortunately it is very loud, so Sarah is leaving with Abigail quite after the meal. The sun is shining at 11°C and start at 9.30 a.m. heading to Cusco. I find even a gas station with 95 gasoline which is very seldom here. Until Juliaca it is quite boring, then it gets much nicer. Unfortunately dark clouds are around and I decide to put me into my rain gear. The rain lasts only for 10 minutes, then the sun comes out again and I have lunch with a very nice professor who is riding a little motorbike. Starched I drive further and have to sidestep often because busses and lorries are ignoring me and overtake on my track. At 3.30 p.m. I reach Cusco fighting with the traffic. In front of the hostel Mama Simona I find Alex’ Africa Twin. Unfortunately there is no parking for Felg, and so I have to bring it to a garage which is even better than keeping it on the street. We spend the whole evening together talking about the last 2 months and eating fine fruits, vegetables and cheese from the market with other Germans. To find the right package and agency for the trip to Machu Picchu is not that easy. Before the final decision I take part of a Sightseeing walk (Free Tours by Foot) with Elvis. Since there is actually a festival in town he explains us the different meanings. Then he shows us the palaces and famous places of the city. I decide to go with EcoPackers, because Luis is very helpful and can arrange one of the last tickets to the Montana, which closes on 15.4.. In the evening I meet Alex and Isi again to drink a very good Pisco Sour. They start to walk a trail to Machu Picchu already at 5 a.m. while I have to be at the hostel at 9.45 a.m.. I meet Rachel und Bill from Californa and with 17 other people we drive with a mini bus to Ollantaytambo where the president of Peru will land in 30 min. After a longer stay the train brings us to Agua Calientes. Since I have some time to the briefing I go to the hot springs for 10 Sol (€2,50) and enjoy the heat. As I think I have to walk more than enough tomorrow I decide to buy a bus ticket for US$12,- to the entrance. I wake up at 5, have a short breakfast and go up by bus at 6 a.m. Cesar, our guide, is waiting for us and tells us within the next 2 hours a lot about the history and technicians from that time. As we missed the turnoff to the mountain we reach the sun gate from where we have a great view over Machu Mich as well. Alone I go back quickly and get the permission to enter the mountain even at 10.30 a.m. Within only 75 minutes I reach the top of Montana with a gorgeous view. At 12 p.m. the ranger is pushing all of us to leave the top. After 60 min I’m back to the entrance and had lunch with Bill and Sarah before I go to the Inka bridge and finally doing the full circuit through complex. The fog creates many spooky views and finally a rainbow shows up. After 22km and 280 floors of walking I take the bus at 4.30 back to Aqua Calientes. What a great day.. 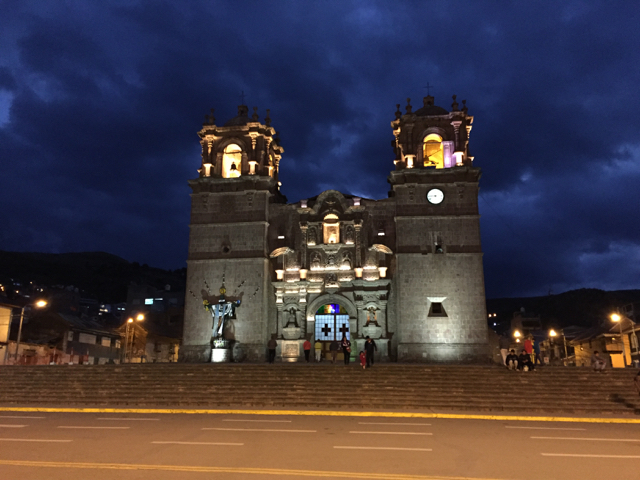 Going back by train and bus I reach Cusco at 10.15 p.m. and close the day by a fantastic steak on the Plaza de Armas. Today is washing day and updating the blog. The tour to the jungle takes place beginning on Sunday. Hurray! The rest of the day I spend in the hostel. It is raining almost the whole afternoon. This entry was posted in Bolivia, Peru by Th. Buttgereit. Bookmark the permalink.